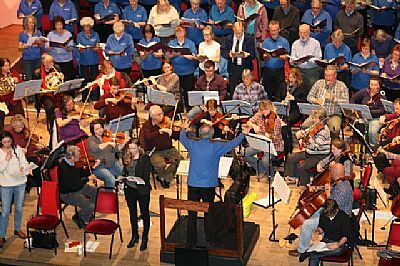 Inverness Choral Society can trace its roots back to the mid 19th century but it was not until 1960 that it became an independent body, having previously been run as an evening class under the Education Authority. In 1976 the 58 members of the Inverness Choral Society amalgamated with the 24 members of the Balloch Choir to form the Inverness and District Choral Society, an occurrence which coincided with the opening of Eden Count Theatre, thus presenting the combined choir with a new and larger venue for their concerts. The name of the Society reverted to Inverness Choral Society in 1996 and the current membership is in excess of 110. Over the years the Society has performed much of the standard choral repertoire as well as more adventurous works such as Orff's Carmina Burana (2002, 2013) Fanshawe's African Sanctus (2003, 2015), Jenkins's The Armed Man (2006, and by popular demand, again in 2009) and a concert version of Bizet's Carmen (2001). In 1990 it performed a specially commissioned work by Gordon Tocher, at the time, the choir’s Assistant Conductor, now its full-time conductor. The choir has also given the first performances in the Highlands of some of the greatest works in the choral repertoire, among them Elgar's Dream of Gerontius (1995, 2011) and The Kingdom (1998); Bach's Magnificat and Handel's Dixit Dominus (2005). In addition to its main concerts, the Society also gives other performances. It sang for the celebrations for the Highland Year of Culture in 2007 and in the BBC's Christmas Eve service in 2008. In December each year the Society stages a 5-hour charity Carolthon in Inverness's main shopping mall, the Eastgate Centre. The money raised by this event is divided between the Society and a local charity. (See Events page). New members are always welcome! See the NEW MEMBERS page for information.